…would you still consume it? Of course not! And yet, millions of Americans (including our precious children!) are doing exactly that by consuming Splenda. So, what is sucralose, chemically speaking? Despite the intended insinuation, sucralose is not a form of sucrose (cane sugar). Sucralose/Splenda is produced through artificially substituting three hydroxyl groups (hydrogen + oxygen) with three chlorine atoms in the sugar (sucrose) molecule. Natural sugar is a hydrocarbon built around 12 carbon atoms. 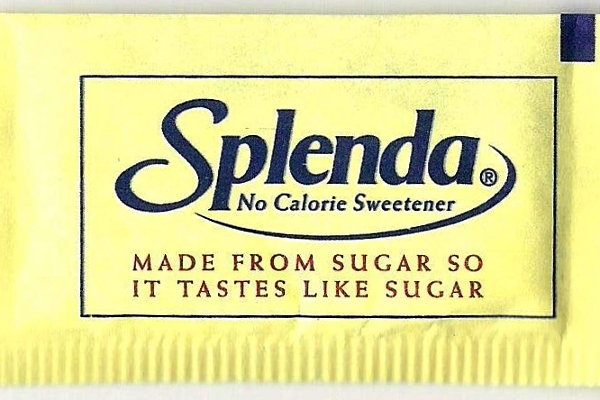 When transformed into Splenda it becomes a chlorocarbon, in the same family as deadly pesticides like DDT, insecticides, biocides, disinfectants like Chlorox Bleach, and WWI poison gas like dichlorourea. How can this be true for an FDA approved sweetener? FDA approval does not in any way guarantee safety… sadly enough, in many cases, it guarantees the exact opposite. Take aspartame for instance. Aspartame (Equal/NutraSweet) contains 10% methanol, which is broken down in our body into two extremely toxic substances: formaldehyde and formic acid. There are over 30 known adverse health effects associated with its consumption! This sweetener gained FDA approval in 1981, despite appalling evidence linking it to cancer, particularly, brain cancer. So, if Splenda is not a viable alternative to sugar, what can we use instead? When one uncouples the experience of “sweetness” from caloric content, the body becomes confused because it does not receive nourishment and therefore will not attain satiety – this, in turn, leads to overindulgence. Indeed, new studies have shown exactly this: those who consume synthetic sweeteners are more prone to obesity. What this means is that when we ingest something sweet, it should also have caloric and nutritional content. Anything less than this equation is a recipe for failure and ill health. Thankfully Nature provides us with a veritable cornucopia of healthy sweeteners: honey, stevia,xylitol, erythritol, and dehydrated organic cane juice, all of which are available at your local health food store. Next time that sweet tooth calls, remember not to succumb to advertising hype which would convert poisonous chemicals into “magical” no-calorie sweeteners. Use both common sense and a sense of moderation, and your body will thank you.